The dark photon is a hypothetical massive spin-1 boson mixing with the ordinary photon. The minimal model is fully characterized by just 2 parameters: the mass mA' and the mixing angle ε. This scenario is probed by several different experiments using completely different techniques. It is interesting to observe how quickly the experimental constraints have been improving in the recent years. The latest update appeared a month ago thanks to the NA48 collaboration. 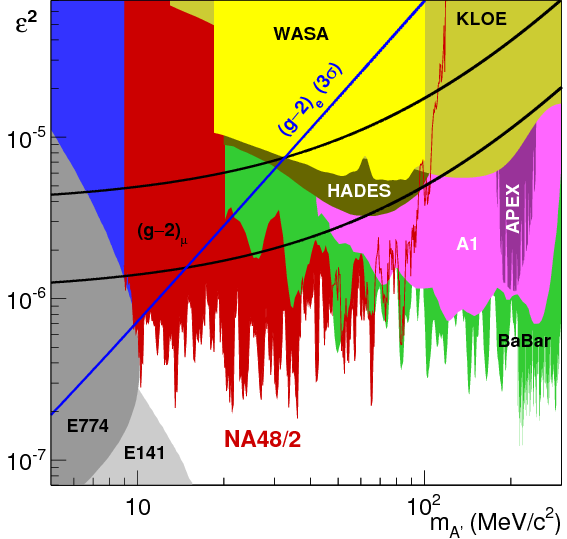 NA48/2 was an experiment a decade ago at CERN devoted to studying CP violation in kaons. Kaons can decay to neutral pions, and the latter can be recycled into a nice probe of dark photons. Most often, π0 decays to two photons. If the dark photon is lighter than 135 MeV, one of the photons can mix into an on-shell dark photon, which in turn can decay into an electron and a positron. Therefore, NA48 analyzed the π0 → γ e+ e- decays in their dataset. Such pion decays occur also in the Standard Model, with an off-shell photon instead of a dark photon in the intermediate state. However, the presence of the dark photon would produce a peak in the invariant mass spectrum of the e+ e- pair on top of the smooth Standard Model background. Failure to see a significant peak allows one to set limits on the dark photon parameter space, see the dripping blood region in the plot. So, another cute experiment bites into the dark photon parameter space. After this update, one can robustly conclude that the mixing angle in the minimal model has to be less than 0.001 as long as the dark photon is lighter than 10 GeV. This is by itself not very revealing, because there is no theoretically preferred value of ε or mA'. However, one interesting consequence the NA48 result is that it closes the window where the minimal model can explain the 3σ excess in the muon anomalous magnetic moment. What I think is most interesting about a result like this is that it comes from going back to an experiment from more than a decade ago and doing more analysis on the data. If BSM physics were really lurking in an energy range or other experimental regime that's "just around the corner" then I would expect more anomalies in recent data sets, and more analyses showing that old data is at least tantalizingly consistent with whatever BSM model. I suspect that the LHC will fail to find any strong evidence for BSM physics simply because it hasn't yet found any weak evidence for BSM physics. I think the muon g-2 experiment has already put un upper bound on the potential dark photon mass at around 200 MeV. Also, I think experiments that involve missing mass could be a better approach to finding a dark photon. The less presumptuous we are about the decay channels, the better! @Alex: Every 2-3 sigma excess from LHC experiments (and there are many, in agreement with the many studies done) could turn to 5 sigma within the next 1-3 years. @RBS: There was a talk at this year's Moriond conference, but I don't know which one. With notable significance: Muon g-2, positronium hyperfine structure (probably explained by an unaccounted systematics from cooling), P'_5 at LHCb.